When the veggies in the fall garden look lonely, I give them company by sowing cover crops of winter wheat and cereal rye. When planted in autumn, cold-hardy grains take up nitrogen that was not used by summer vegetables, and hold it in their tissues until it is cycled back into the soil when the plants decompose. All the while, they suppress winter weeds, prevent erosion, and improve soil structure with their vast networks of fine roots. For the gardener, there is the additional pleasure of seeing vibrant patches of green first thing in spring, or throughout winter in climates where there is enough light and warmth to keep the plants actively growing. Plantable winter wheat and cereal rye seeds are as close as the bulk bins at your local health food store. Organically grown and food-grade clean, you may find them labeled as "wheat berries" or "rye berries." In my experience, both wheat berries and rye berries (seeds) germinate willingly when planted in vacant spaces in the garden in early autumn. I should note that cereal rye and annual ryegrass are different plants. Certainly you can use annual ryegrass as a winter cover crop, but I find cereal rye easier to manage. Each cereal rye plant forms a dense clump that can be dug and pulled quickly using hand tools. In addition, cereal rye and wheat produce decorative tops to gather and dry for use in flower arrangements. Both grains initiate seed production in late spring, when days become 14 hours long. I cut the tops as soon as they stiffen but before they fill up with seeds. At this point, the plants are thick bundles of grassy foliage, ideal for use as mulch or as greens for composting. A relative newcomer to the world’s grain supply, cereal rye (Secale cereale) was regarded as a weed until around 2,500 years ago, when German farmers began cultivating it as a grain crop. Tolerating cold to -30°F (- 34°C), rye also has the ability to germinate when soil temperatures are low. Most gardeners can sow rye berries well into the fall, when the best planting times for other cover crops have passed. Tough little cereal rye plants patiently wait out winter, with or without a cover of snow. They show vigorous new growth starting in late winter, and recover nicely even when nibbled to the ground by deer. As soon as I gather the decorative tops in late spring, I use a digging fork to loosen the soil, and then pull up the plants. Then I allow the plants to dry in the sun and use them later in the season as homegrown mulch. 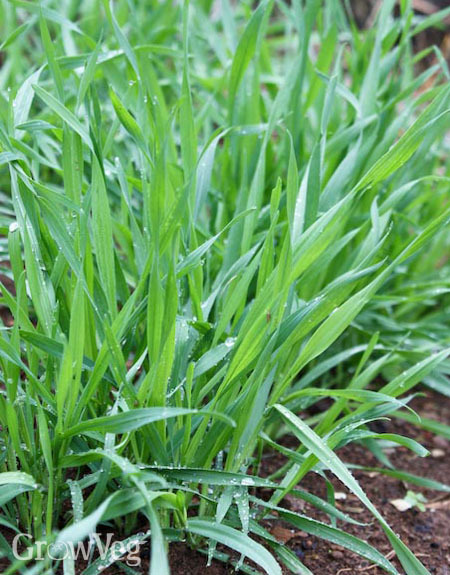 Decomposing rye foliage contains chemicals that inhibit the germination of weed seeds; studies have shown that rye foliage can reduce germination of many seeds by more than 90 percent. Rye hay makes a terrific mulch for tomatoes, capsicum, and other plants typically set out as seedlings. Unfortunately, wheatgrass doesn’t taste very good, at least to humans. Cats and dogs, on the other hand, love to graze on tender wheatgrass (or rye seedlings) grown in containers. So-called "catgrass" is often a mixture of wheat, rye, and other grasses, which are easily grown indoors in winter, either in a sunny windowsill or beneath florescent lights. After your pets have enjoyed munching and mangling a container of seedlings for a few weeks, you can start a new planting and transplant the tattered clump in your garden. If the weather is kind, you will have a micro-patch of winter grains helping to safeguard your soil until spring returns once again.